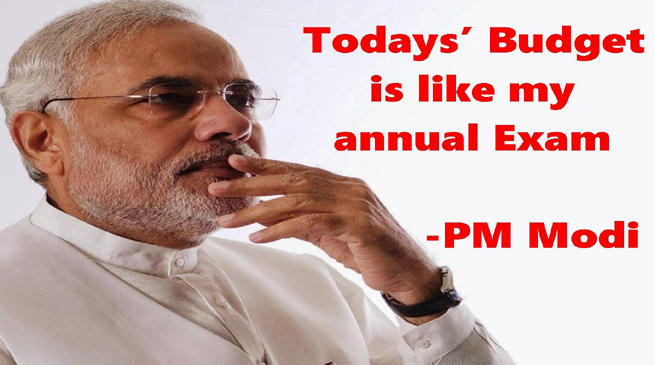 “I have an exam tomorrow,” Prime Minister Narendra Modi said on Sunday, referring to presentation of General Budget 2016, in the Parliament as he gave a pep talk to motivate students appearing for final exams. PM Modi said he was “full of confidence” ahead of his “examination” by 125 crore people, a trait which he wanted students to emulate when they appear for their examinations for Class X and XII starting Tuesday. In his monthly radio programme ‘Mann Ki Baat’, he emphasised that students should appear for the exams with a “positive approach” having free and calm mind without any anxiety. He also asked parents not to put pressure on them. In this context, he cited his example in the context of presentation of Budget which all the countrymen closely monitor and analyse. Underlining that “positive approach” and “positive frame of mind” help in all aspects of life, the Prime Minister talked about himself and said when he comes across some issues which he is not familiar with, he concentrates to deal with them. “Sometimes I feel tension within. Then I feel that I should relax a bit so that I feel good. So I have developed my own technique. I do some deep breathing. I take deep breath three times, five times. It may take a few seconds but my mind becomes ready to deal with the situation with a calm mind. This may be my experience but this may help you too,” he told the students. To motivate the students, the Prime Minister also invoked Thomas Alva Edison, who invented electricity, and J K Rowling of Harry Potter fame, saying their success had possibly come after many failures. “There is success in failure too” if there is a positive approach, he said, while asking students to have dedication, determination and diligence to achieve success. Giving example of Sachin, Modi asked students not be burdened by expectations of others but set their own targets with “free thinking, free mind and independent capability”. He told students that nobody can stop them if they set out to break their own records. The students should link their efforts to acheive big goals like Sachin and even if the targets are not achieved, do not be demoralised but try harder, Modi said.